Posted on January 3, 2019 - By Fucosoft | Follow YouTube, Twitter to Get More Information. WhatsApp is one of the most popular instant messaging app in the world. You can start video calls and send encrypted text messages, videos, photos, and audio messages with no limits or fees. But if you get a new iPhone XS and transfer your WhatsApp account to it, your old conversations and chats don’t automatically come with you. Don’t worry. 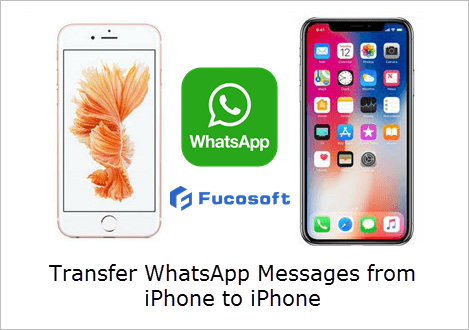 This article is here to show you great options to transfer WhatsApp messages from old iPhone to a new iPhone, including the latest iPhone XS, iPhone XS Max, iPhone XR. 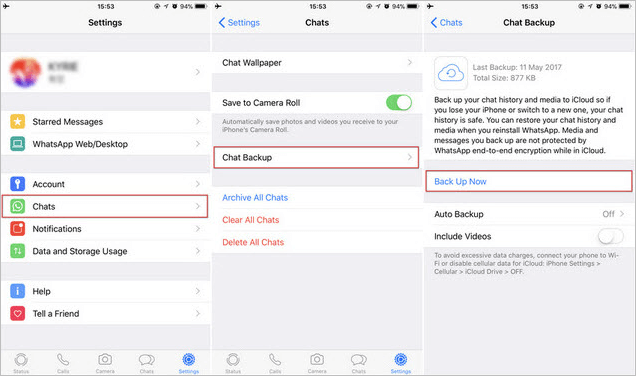 Though WhatsApp doesn’t store chat histories on its servers, it include iCloud backup feature to allow users back up and restore chat history. You can utilize this feature to transfer WhatsApp messages from iPhone to iPhone with ease. On your old iPhone X/8/7/6s, go to WhatsApp Settings > Chats > Chat Backup and tap “Back Up Now” to make a manual backup of chats to your iCloud account. On your new iPhone XS/XS Max/XR, install WhatsApp and login with the same phone number. After verified, you can follow the on-screen prompts to restore chat history. Note: Please make sure that you should have iCloud backup function enabled on both your iPhones (iPhone Settings > iCloud > turn iCloud Drive and WhatsApp ON). And there must be enough free space in your iCloud account and your iPhone devices. Download, install and run Fucosoft iPhone WhatsApp Transfer on your computer, then select “Acquire Backup from Device & iCloud” and click on “Back Up Device”. Connect your old iPhone X/8/7/6s to the computer and select “WhatsApp”, then click “Back Up” to save your old iPhone’s WhatsApp chats to computer. Once the backup is complete, disconnect the old iPhone and connect your new iPhone XS/XS Max/XR to the computer and select “Restore Backup to Device”. Select the backup that you want restore and click “Restore Partial Backup”. Then check “WhatsApp” and click “Directly Restore” to transfer WhatsApp chats to your new iPhone. If you don’t want to install third-party tool, you can try Apple’s iTunes or iCloud backup service to transfer WhatsApp messages to a new iPhone. But you should know that both iTunes and iCloud will wipe out all current data on your target iPhone. If it’s okay to you, you can follow this Apple Support page to backup your old iPhone WhatsApp with iTunes/iCloud and then restore them to your new iPhone. Best software to recover lost data from iPhone, iPad or iPod touch. Copyright © 2019 Fucosoft. All Rights Reserved.